First off, there are no floods in Phuket, or anywhere within about 800km of here. The Thai floods in the last couple of months have affected some areas in the north of Thailand, central Thailand, and as the waters moved downstream, areas in and around Bangkok has been affected. Could last a while yet. It's not like all of Bangkok is flooded, you can stay in Bangkok, the airport (Suvarnabhumi) is open and operating normally. Not very nice for people who are affected of course. The floods will pass, and in Ayutthaya the clean up is underway and factories are getting re-opened. Richard Barrows website has updates on the flood situation. What about Phuket? Well, we had been having some perfect weather at the end of October. Not much rain except for evening or nighttime thunderstorms, which is normal for the time of year, as the low season winds stop blowing. Heat builds up during the day and you need a nice thunderstorm to cool off. This weather has continued during the last week. Please note when you see the *thunderstorm* symbol on a weather forecast, it does not mean you'll have a wet day. This is tropical weather, and a quick rainstorm is normal. Rain might last 20 minutes, or 30, maybe even an hour. The photo below was taken a few days ago by Dawn who runs the restaurant at Bon Island. I think this sums up the weather at this time of year - calm clear sea, sunshine and an approaching mass of dark cloud. Then a brief heavy downpour and probably the sun will burn through again. It's been hot for the last few days, which is not really a surprise in Phuket. Don't be fooled by a few clouds and some thunderstorms. You can still get sunburn (even in a thunderstorm!). Weather is good. The sea has been very calm, great for diving or anything on the water. And officially it's high season now - November. I have been very very busy in the dive shop in the last week. 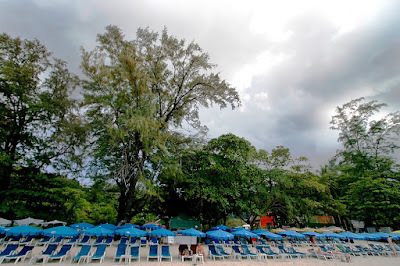 Not much time (or energy) for blogging, though I do try to update the "micro blogs" - please do join the Phuket Page on Facebook, or Follow me on Twitter for regular/daily updates of Phuket news and weather. We have noticed bookings dropping off in the last week as news, accurate or not, from Bangkok heads out into the international media. I saw a photo on Twitter last week (sorry, can't find the photo now) showing a news crew shooting in a puddle on an otherwise dry road. Be careful what you believe (unless I'm saying it, then its guaranteed cast iron truth)! Check this report on csmonitor.com. Quote "Thailand's devastating flood has made for countless memorable images. But some journalists appear to be staging their own scenes without disclosing that to viewers, undermining the purpose of journalism." With that in mind... this morning I stopped to take a few quick photos at Kata Beach. Not so many people around at 9am. Sky was blue, clouds just a few, small waves tinkling on the sand. Perfect! Looking away from the sea, a row of beach chairs, trees and what's that? Dark skies? Clouds? Chance of rain? See, I could have just shown the first photo and everyone would believe it was a perfect day. 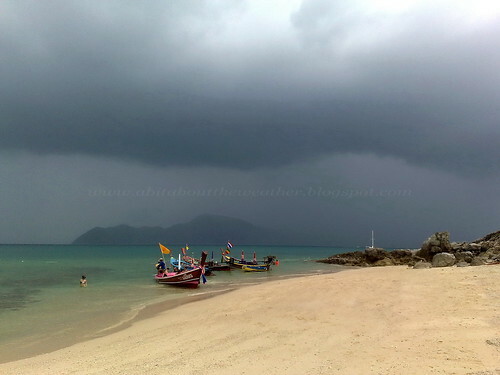 Well, the day was good, but Phuket does have clouds and rain. 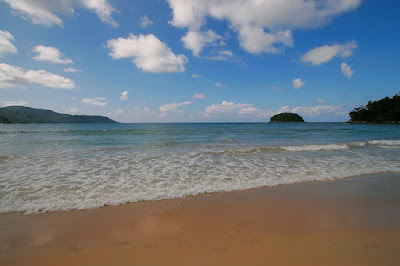 If we did not, Phuket would be a desert rather than a very green tropical land. 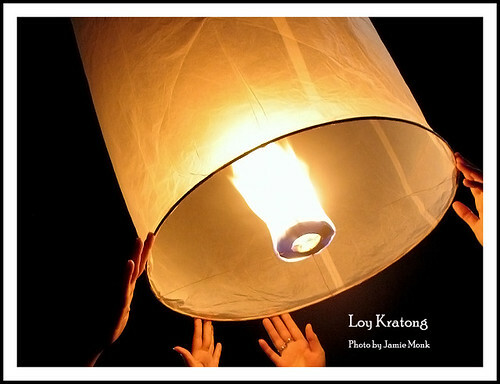 Happy Loy Kratong! If you are in Phuket well there are big celebrations at Patong, Karon, Chalong Bay and more. We will try to close up the dive shop a little early tomorrow so we can all enjoy the evening with our families. And it better not rain!